Parking.com Flex Parking - Pay for each hour based on your stay. Parking that fits your schedule. For a limited time only at select locations. A new pricing structure where you pay a flat rate for a block of time and a nominal rate for each additional hour if you decide to extend your stay (up to the 24 hour max price). 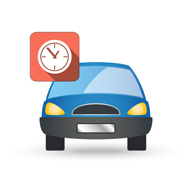 Giving you more flexibility with your time, and less worry on parking! Andy parked at Garage B which used to be 1, 2, 10, & 24 hour rates. He went to see a movie and returned to the garage after 2.5 hours. Under the old pricing, Andy would have had to pay $40 for 10 hours of parking. 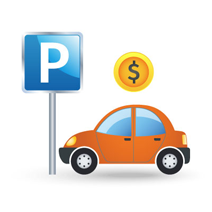 Under Flex Parking, parking at Garage B costs $25 for the first hour + $3 each additional hour. Andy saves with Flex Parking by only paying $31 for 3 hours of parking. * Prices above are for illustrative purposes only. Please see below for pricing and locations. See below for a list of participating locations and FAQs. * Prices are inclusive of 18.375% tax. Oversize fees and/or special event rates may apply. 1. How do customers benefit from Flex Parking? Flex Parking eliminates the need to rush to the garage if you stay longer than your initial desired time and fear of incurring a significant price increase. 2. How does Flex Parking work? Pricing is based on Length of Stay. Customers pay for the cost of a minimum stay + a nominal cost for each additional hour they decide to stay, up to the Daily Max. 3. What is the Daily Max? The Daily Max is the maximum price that will be charged over a 24 hour period. This is our way of protecting customers from hourly charges that could add up quickly; as a result some locations will reach the Daily Max prior to 24 hours of parking. 4. What are the additional charges if I park longer than 24 hours? After the first 24 hour period the Daily Rate structure starts over again. 5. What are Morning, Evening, and Weekend Specials? How are they different from the Daily Rate? Customers can receive additional savings by entering at select times. The pricing structure for Morning, Evening, and Weekend Specials are similar to the Daily Rate, but are often discounted. Note: All specials have specific entry times and a maximum length of stay. 6. What if I exceed the maximum hours for a Special Rate? The Daily Rate structure will apply to the entire stay. 7. I have an oversized vehicle, does the Oversize Add-On apply? Yes. Oversized vehicles are charged a daily flat fee in addition to the Daily or Special Rate. 8. I am parking during Special Event hours, how does the Special Event rate apply? The Special Event rate will replace the Daily and Special Rates. 9. Why does pricing vary depending on when I entered the garage? We try to pass on the savings when the garage isn’t busy or full. 10. Why are you showing prices inclusive of tax? We want to make it easier for customers to understand how much their parking will cost. 11. I normally use coupons, what will happen to those? Coupons will still be available for locations that offer them. 12. I am a monthly parker, does this change impact me? No changes will be made to your monthly parking. 13. I parked overnight while the facility was closed. How does that work? Hourly charges will continue to incur, until the daily max has been reached. In which case, the daily rates will start all over again. 14. Why only these locations and not all parking locations? We hope our customers will see the benefit in this new price structure so that we can continue to implement it at the remaining locations. 15. Why are you charging a minimum rate, why not a simple hourly rate? We service all parkers with a variety of needs from those who park short, park long, park and work, park multiple times and those who don’t park often. This new structure was designed to accommodate all of our parkers. 16. The Morning Special ends at 10am and I entered at 10:05am, is there a grace period? Unfortunately there is no grace period. 17. I pre-purchased my parking online, what if I depart later than what I purchased? 18. I pre-purchased my parking online for entry during the Morning Special however I arrived after the entry period for the Morning Special ended; will this impact the price I will pay? Yes it will impact the price. Specials are meant to pass along savings when the garage isn’t busy/full. If you enter during a period that is more expensive than the one you originally purchased then the price of your stay will be recalculated and you will be charged an additional amount from what you originally paid online.